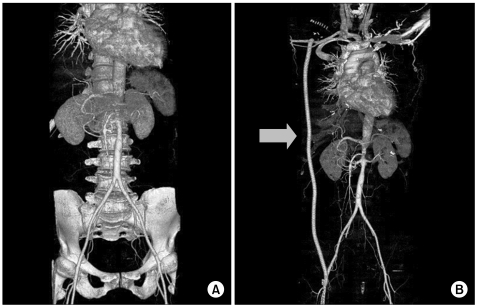 A axillo-bifemoral/femoral bypass is typically undertaken when there is significant aortic occlusion or bilateral iliac occlusion in a patient not fit or suitable for aortic surgery. It involves dissection of the axillary artery as well as the common femoral arteries. These are slung and clamped where the artery becomes healthy again, with the artery opened longitudinally and a graft, tunnelled superficially between the incision, is anastomosed. Fig 1 – Axillofemoral bypass. (A) Preoperative CT showing marked irregular narrowing of the descending thoracic and abdominal aorta. (B) Postoperative CT showing a patent axillofemoral bypass graft. Haemorrhage This can occur due to damage to either the artery or the femoral vein or its branches, and may require blood transfusion(s). Bleeding There is a small chance of bleeding and bruising in the groin or axilla post-operatively.